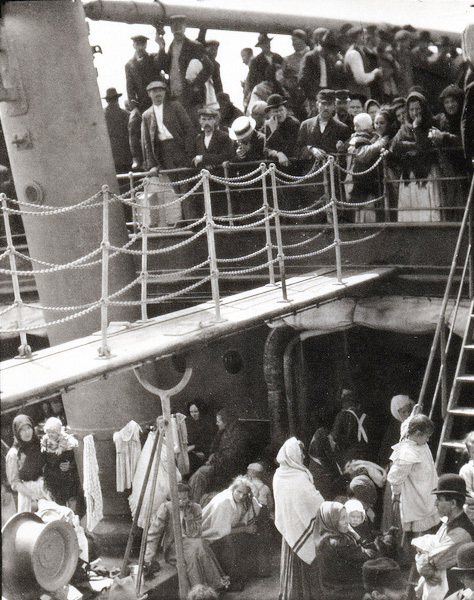 “From the moment we boarded the steamer until we landed, no woman in the steerage had a moment’s privacy. One steward was always on duty in our compartment, and others of the crew came and went continually. Nor was this room a passageway to another part of the vessel. The entrance was also the only exit. The men who came may or may not have been sent there on some errand. This I could not ascertain, but I do know that, regularly, during the hour or so preceding the breakfast bell and while we were rising and dressing, several men usually passed through and returned for no ostensible reason. If it were necessary for them to pass so often, another passageway should have been provided or a more opportune time chosen. “As not nearly all the berths were occupied, we all chose upper ones. To get anything from an upper berth, to deposit anything in it or to arrange it, it was necessary to stand on the framework of the one below. The women often had to stand thus, with their backs to the aisle. The crew in passing a woman in this position never failed to deliver her a blow [swat her backside]—even the head steward. If a woman were dressing, they always stopped to watch her, and frequently hit and handled her. Even though they were sent there, this was not their errand. “Two of the stewards were strict about driving men out of our quarters. One other steward who had business in our compartment was as annoying a visitor as we had and he began his offenses even before we left port. Some of the women wished to put aside their better dresses immediately after coming on board. As soon as they began to undress, he stood about watching and touching them. They tried to walk away, but he followed them. Not one day passed but I saw him annoying some women, especially in the wash rooms. At our second and last inspection, this steward was assigned the duty of holding each woman by her bare arm that the doctor might better see the vaccination. “A small notice stating the distance traveled was posted each day just within the entrance to our compartment. It was the only one posted in steerage as far as I could learn, and consequently both crew and men passengers came to see it and it served as an excuse for coming at all times. The first day out the bar just within our entrance was used. This brought a large number of men into our compartment, many not entirely sober, but later the bar was transferred. “One night, when I had retired very early with a severe cold, the chief steerage steward entered our compartment, and not noticing me, approached a Polish girl, who was apparently the only occupant. She spoke in Polish, saying, ‘My head aches—please go and let me alone.’ But he merely stood on and soon was taking unwarranted liberties with her. The girl, weakened by seasickness, defended herself as best she could, but soon was struggling to get out of the man’s arms. Just then other passengers entered and he released her. Such was the man who was our highest protector and court of appeal.